The palm Sunday is the religious feast of Christian, especially this day is celebrated or remember Jesus entered Jerusalem as Savior and king. This day is celebrated in church and distribution of palm trees. Palm branches represented Goodness and victory. Here in this section we are sharing a collection of wishes messages for palm Sunday. You can send these wishes messages to your friends and family member. We are blessed is the one who comes in the name of the Lord! Hosanna in the highest heaven. May the Lord bless you and fill your heart with joy and love. Have a Beautiful Palm Sunday! May goodness surround.Happy palm Sunday! during the ups and down. and fill your heart with warmth of joy and happiness. May the holy spirit will bloom your heart and the beauty of springtime. on the bright side of everything. 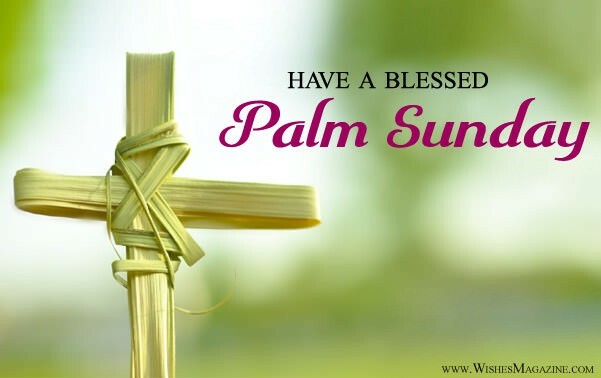 Have a blessed Palm Sunday! because life is the greatest blessing we have, live it to the fullest. Have a blessed and happy palm Sunday! May Lord bless you with fearless life, God is around you. You just need to trust him for the happiness and joy in the life. Never lose faith, hold on to hope and Trust God. May the love of our Savior, Jesus Christ,surround you all the days of your life. and throughout the coming year. Happy palm Sunday!